Nothing makes a day at the office more miserable than neck and back pain. However, a lot of us deal with it each and every day. Americans are spending $50 Billion dollars a year on lower back pain. We're the ones with our chiropractor on speed dial! Not only is pain a part of our daily routine, we've spent our life savings, an arm, a leg, and a kidney or two buying ergonomic chairs, cushions, and electric shock therapy trying to find relief. Thankfully, there is a solution to some of that pain. It might not be the cure-all that turns you into a mix between Stanley from The Office and Iron Man, but it's the next best thing. First, let's take a look at why we experience the pain we do, and then look at how a standing desk can help. This may sound funny, but most people don't know how to sit at a desk. You probably don't think much about it, but there's a science to sitting at a desk and working at your computer correctly. The height and angles of your desk, keyboard, and computer screen can all contribute to neck and back pain. Sitting at a desk doesn't promote a healthy posture. More than likely, when you sit, your back and shoulders are slumped and your neck and head are pushed forward. This position is the most common contributor to back and neck pain. The weight of your head pulling forward puts a crazy amount of stress on your neck and overworks your upper back muscles. If you're sitting still for too long during the day, soft discs between vertebrae in your back are squished unevenly and not able to expand and soak up blood and nutrients. This means your spine is less flexible and you're at a higher risk for disk damage. If you're sitting all day, you're putting between 40-90% more pressure on your backthan you do when standing. Standing desks have come to the rescue of people who are ready to ditch neck and back pain and pursue a healthier lifestyle. If you're not experiencing pain yet, then be proactive about your health and prevent it. Standing up releases the pressure on your neck and back and promotes a healthier posture. Standing for just over an hour a day reduces neck and back pain by about 54%. Some people still complain of back pain at work while using a standing desk. This goes back to ergonomics. If your desk, keyboard, and computer screen aren't in a comfortable position, you're still adding unnecessary strain on your body. A height-adjustable desk is an easy fix for this. It allows you pick the perfect desk height for you. You may be ready to go all in and stand while you work for the rest of your life. We commend your exuberance, however, standing too long in one position has its own set of problems. Why not do your body a favor and enjoy the best of both worlds? Sit-to-stand desks are a healthy way to conquer neck and back pain while taking care of the rest of your body. These desks allow you to easily transition between sitting and standing throughout the day. Standing brings with it a ton of healthy benefits, including back and neck pain relief, and giving yourself breaks to sit down throughout the day keeps you from being in one position for too long. For even more convenience, motorized standing desks allow you to adjust the height of your desk with the push of a button. Some electric sit-to-stand desks also have memory controls, so you can save your height settings. Finding a comfortable desk height is key getting the most out of your standing desk, which makes this a great feature. 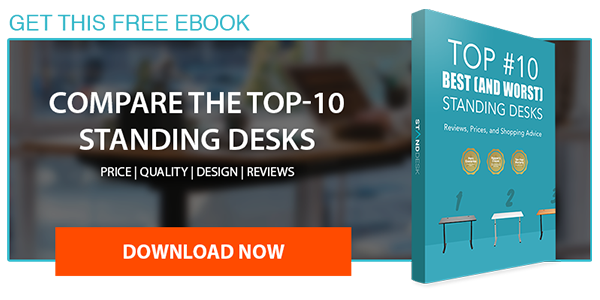 Choosing to work from an adjustable standing desk is a lifestyle choice that can quickly adjust your comfort level and prevent damage to your back and neck brought on by sitting. Relieving pain can mean a brand new attitude and more pleasant work experience, plus you get the added benefits of being more productive and improving your health in other ways. Don't let back and neck pain cause you to dread going to work. Make the easy switch to an adjustable standing desk and start enjoying the benefits.